This is the final part of my 3 part Valentines series. 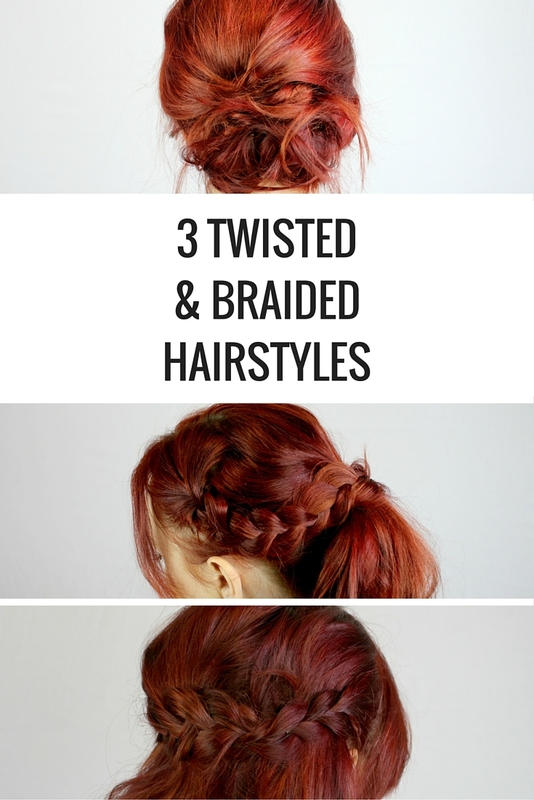 I just love a great twisted or braided hairstyle, and all of these looks have a feminine, soft feel making them great for Valentines Day. 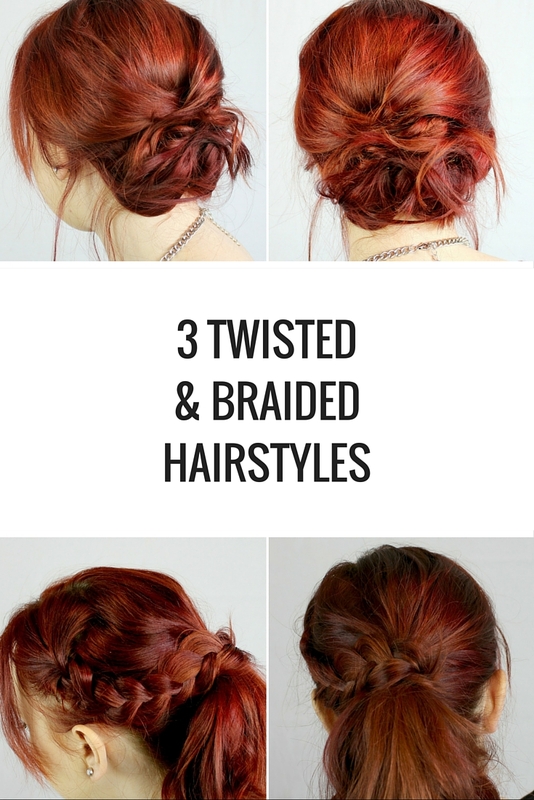 You don’t have to limit these to V-Day though, I wear the last 2 on the regular and will start doing the twisted updo hairstyle more now that I know how simple it is to do. 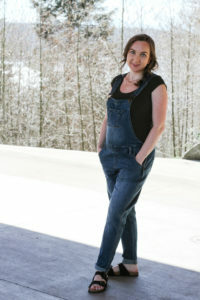 If you’d like to check out the rest of the Valentine’s Day Series you can check out my 10 Fun Date Ideas post, and my 3 Valentines Day Outfit Ideas post. Happy V-Day everyone! I’m really happy with how this hairstyle worked out. It was fairly easy to do – I didn’t even check the back of my head in the mirror while I did this! 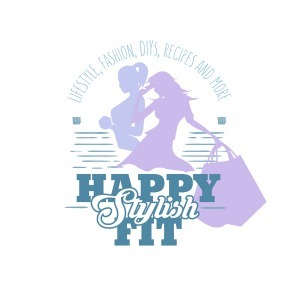 Curl your hair – I quickly curled mine with a flat iron, but feel free to skip this step if you want to. Pin the top portion of your hair in place – tease first if you want more volume. Bring the side top portions of your hair back, and twist together. Take a comb and tease the twist, then spiral it and pin in place – I used texturizing spray to help everything stick together. Repeat the previous step for 2 – 3 more sections of hair, make sure to secure everything with a lot of bobby pins. Pull out face framing pieces and set with hair spray/texturizing spray. 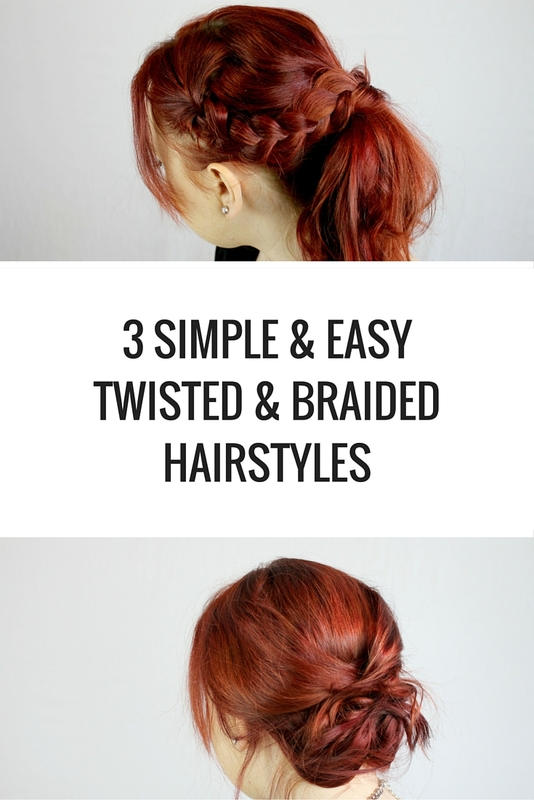 This is a simple braided hairstyle, making it a good choice for those still getting used to doing braids. The main thing to think about when doing the braid is to pull apart and fluff the braid until you get the look you want. Curl your hair if you want more body and volume, or don’t it’s totally up to you. Take the top side portion of your hair and braid it while pulling it towards the back of your head, secure the end with a small clear elastic. 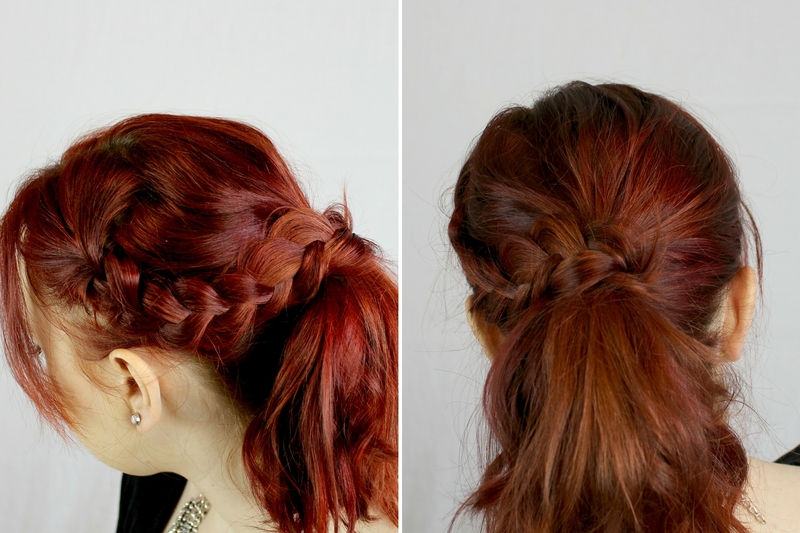 Using your fingers, pull apart and fluff your braid – texturizing spray really helps. 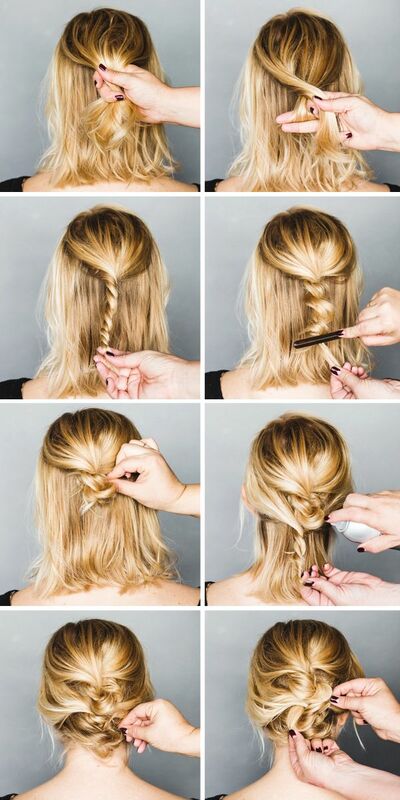 Bring the rest of your hair into a ponytail. You can split it into 2 ponytails (one on top of the other) if you want to add length and volume. 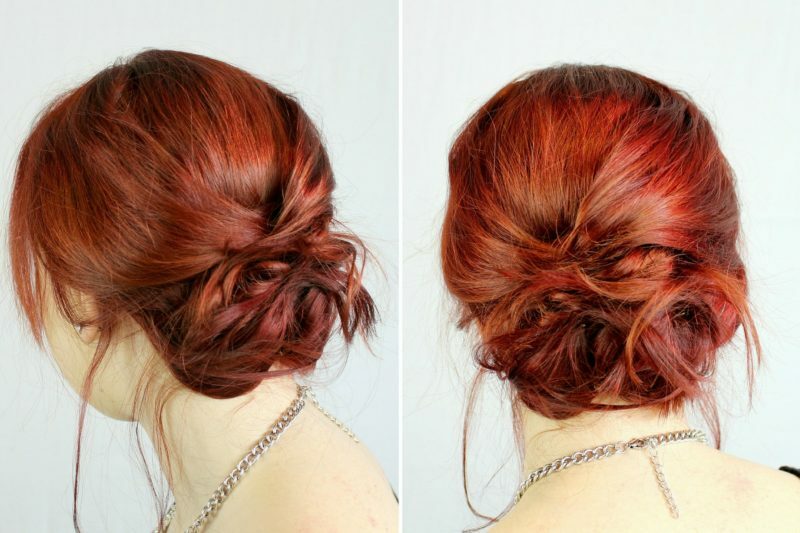 Take the braid and wrap it around the ponytail, securing in place with the ponytail elastic, or a bobby pin. 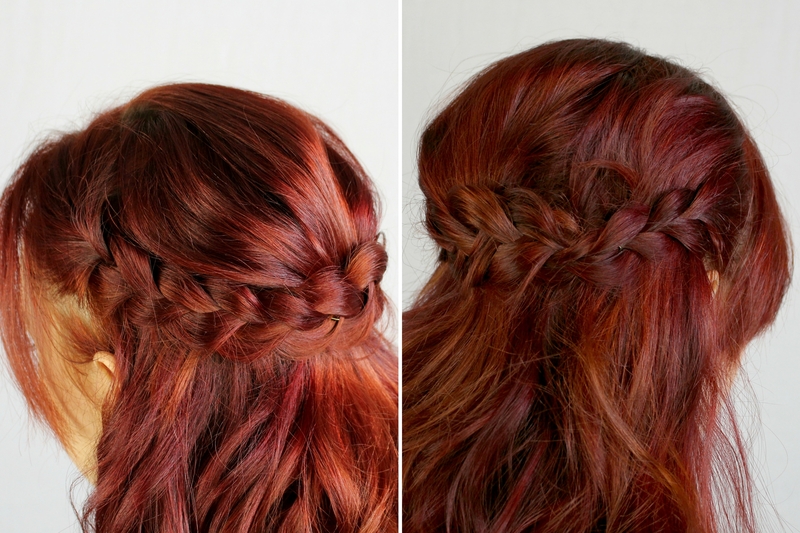 This is another braided hairstyle that is fairly simple to do, and looks great at the same time. This is one of my go to’s for when I sleep in. Curl your hair if you want, or don’t, totally up to you and how much time you have. Take the top, side section of your hair and braid it while pulling towards the back of your head, secure the end with a small clear elastic. Pull apart and fluff your braid – again, texturizing spray definitely helps out. I’ve been using the Fave4 texturizing spray I got in my January Ipsy box and am absolutely loving it! Pull one braid toward the back of your head and secure with bobby pins – you can tease and secure the top portion of your hair first if you want to. Pull the other braid toward the back of your head and secure with bobby pins while making sure to cover the ends of each braid with the other braid. If you’re interested in the Fave4 texturizing spray, or my January Ipsy Glam Bag you can check out my review – subscription box reviews posted a few times a month on the Saturday after I receive them. 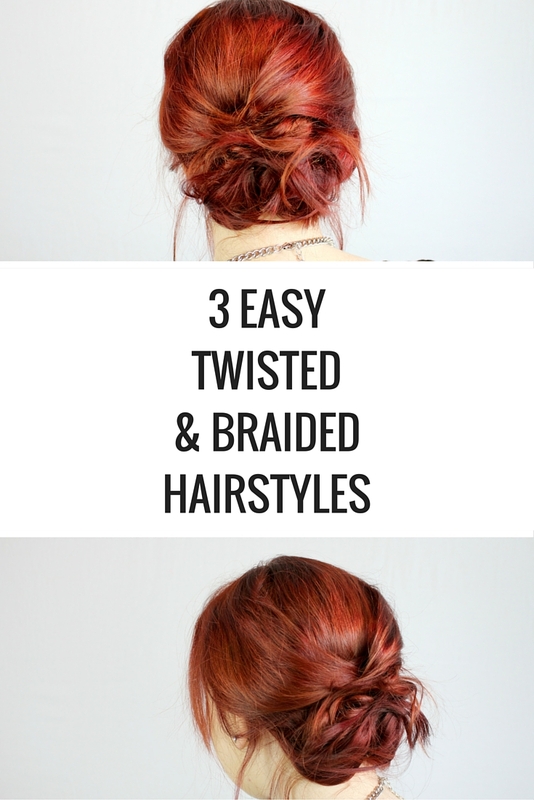 I hope you’ve enjoyed these 3 twisted and braided hairstyles. If you have any questions feel free to leave me a comment below, or contact me through Facebook or Instagram. If you end up trying one of these out, please share it with me on social media, I’d love to see how it turned out!